I’m a true believer in following your gut, particularly when it involves art + subjects. Over the past three years, this particular image has called me to capture it at various times of the day. 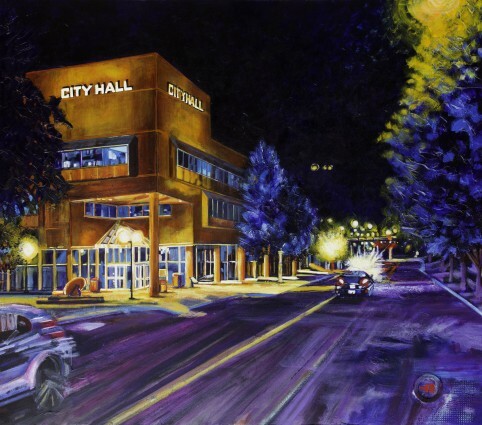 I have photos of City Hall in the daytime and evening, and in the summer, fall and winter. I even have a photograph of City Hall with the old Christmas decorations the City used for the 80s and 90s festive seasons. It was a difficult decision about how to paint City Hall on the Esplanade until I went to New Orleans in March, 2017. All the inspirational and interesting photos I took there were captured at night. When I was planning for this exhibit, I decided on the dark, evening image because I was attracted to the way the bright lights flickered in the dark, making them surreal. It reminded me of the intrigue I felt when I was in the old section of New Orleans. I plan to paint more of these ethereal night scenes in the future.